For sale nice Anthropologie Paint and Petals Quilt Size Queen. A sophisticated rose print from Bay Area artist Bridgette Thornton brings modern artistry to this lightweight cotton quilt.92" x 96" queen 100% cotton Machine wash, tumble dry. · Queen size Coverlet: 86" x 86". This is a very lightweight coverlet with a wonderful, soft cotton material. Machine wash. · Lightweight, screen-printed Cotton. Item must be in original unwashed condition. New in package! Smoke free home I have the matching Sham in a separate listing if you’re interested! Machine wash warm; tumble dry low. 2 standard shams 20 x 26. For pillows 26x26. 100% Cotton Percale. Covers only. Pillow inserts NOT included. Machine wash.
Would you like more details?. Do not bleach or dry clean. Iron on warm heat inside out if needed. All of my items are brand new (unless otherwise stated. This was Bought at Anthropologie without the Plastic Packaging. It has been Kept in a Sealed plastic since purchase and Will be Shipped in It Super Rare Ivory Tiered Ruffle King Duvet Turned Inside Out to Keep Ruffles Pleated Smoke and pet free home, ask all questions before buying, I ship same or next day! Happy to combine shipping and/or price for bundles! Anthropologie Relaxed Cotton Linen Euro Sham 26"x 26"/66cm Navy NEW. Shipped with USPS First Class Package. Super cute and no longer made. Measurements are in the photos. All my items are not always self owned. These items may come from smoking and non-smoking homes. I always wash them or use lysol when shipping. New Anthropolgie Cambridge Standard Shams. This is for a set of 2 Standard shams. Machine wash. Set of two. Standard: 20" x 26". If there is an issue or mistake on my part. King: 20" x 36". Anthropologie Hilvi Embroidered King Duvet Cover. DUVET COVER. Exquisite ruching in waving bands creates textural detail atop this crinkled cotton duvet. DUVET COVER ONLY. There are no holes, stains, or any other wear. Do not bleach, iron or dry clean. Cotton and linen with cotton applique; cotton fill. Set of two. Standard: 20" x 26". Would you like more details?. Do not bleach or dry clean. Iron on warm heat if needed. Each one-of-a-kind quilt is crafted from a lightweight voile and finished with delicate, hand-stitched kantha. -Queen: 92" x 96". Anthropologie Painted Poppies Standard Shams(2) 20" x 26"
Standard: 20” x 26”. Machine wash cold with like colors; tumble dry. Set of two. Leah Goren does not limit herself to one art form. The Brooklyn-based Parson’s alum's sweet, clever and quirky patterns originate from her sketches and watercolor paintings, lending each piece a strong graphic presence. Cute Anthropologie standard pillow sham. "Authentic" ANTHROPOLOGIE Claremore Swiss Dot Duvet Queen. A raised trellis of swiss-dotted cotton makes for a subtle yet sweet sanctuary. White with teal embroidered swiss dots. NEW ANTHROPOLOGIE TASSELED EMBROIDERED ARAYA EURO SHAM 26" X 26"
26" square. Woven cotton jacquard front; cotton slub back. You are buying a Brand New Anthropologie Acarda Euro Pillow Sham 26"x26"
Cotton, viscose; cotton, wool, acrylic tufting. 70"L, 50"W.
NWT! Anthropologie Haven Ivory Throw Blanket-Hand Knit Chunky Sweater/Poms, NEW! This would be great to snuggle under in a chair, couch or bed. Excellent condition! I looked over this throw & it is in great condition. Style No. 47785290 ; Color: Ivory. Enjoy savings on this lovely throw! 68" x 86" Twin;. Machine wash, tumble dry. From draperies to bedding to trousseaus, linen has long been a tactile treat. After all, the flax fiber has been around since 30,000 B.C. when it was first used to secure Egyptian pharaohs in their tombs. New Anthropologie King Thayet Jersey Shams. This is the "Sand" color as sold by Anthropologie. Each one is for a set of 2 King shams. 160g single jersey. Cotton jersey. 270 thread count. Make Supersized Seem Small. (Beautiful shades of white, blue and sea green) to create a serene atmosphere for your bedroom. Beautiful allover tufting inspires triple takes of this snowy quilt that goes with so many décors. Tufted Makers Collection. King Quilt. 96" x 104" Queen. Queen: 92" x 96". Machine wash warm with like colors; tumble dry low. Do not bleach or dry clean. Digitally printed cotton slub; cotton percale back. Embroidered jacquard cotton front; cotton voile back. Iron on warm heat if needed. Machine wash cold; tumble dry low. Full: 86" x 90". Reputation is everything! Each one is for a set of two shams. King: 20" x 36". Set of two. New Anthropologie Imogen Shams. 250 thread count. Machine wash. Set of two. Standard: 20" x 26". Make Supersized Seem Small. If there is an issue or mistake on my part. 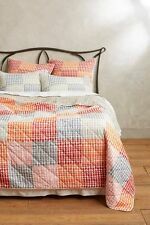 ANTHROPOLOGIE TOULOUSE QUILT NEUTRAL WITH 2 STANDARD SHAMS. ⦁ Queen: 92" x 96". ⦁ King: 96" x 104". ⦁ Cotton, viscose; cotton crochet trim. ⦁ Twin: 68" x 86". A set of two luxurious shams are given a modern twist in dreamy perforated velvet. Set of two shams. 100% polyester with 100% cotton back.